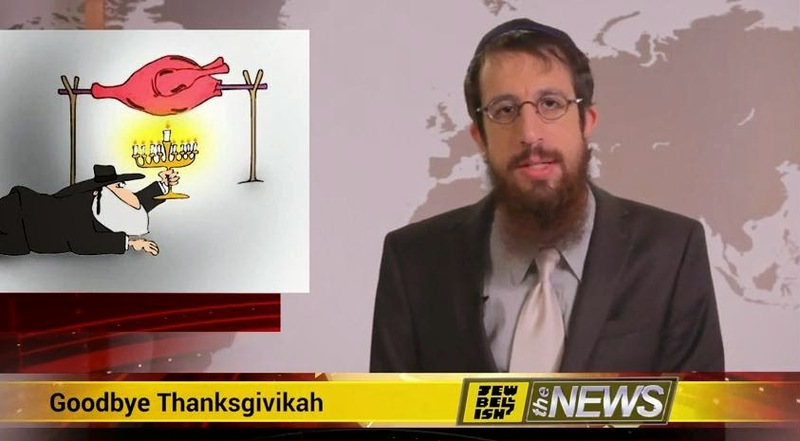 Jewish Humor Central: Hasidic Comedian Mendy Pellin Anchors "Jewbellish the News -- Thanksgiving Edition"
Hasidic Comedian Mendy Pellin Anchors "Jewbellish the News -- Thanksgiving Edition"
Thanksgiving Day is over, but it's turned into a two day holiday with most of us off from school and work. So looking at it as a two-day Yom Tov, we're sharing just one more Thanksgiving video -- the Jewbellish newscast of oddities related to the holiday this year. For example, did you know that this year it will be the first time in 365 days that Thanksgiving doesn't fall out on Chanukah? Hasidic Comedian Mendy Pellin takes the anchor's chair at Jewbellish the News to preside over a little newsy narischkeit after getting some major notice on The Wall Street Journal's front page last week. His co-anchor, Dave Earl Jones, adds an unusual weather report to round out the news.